There are plenty of different online poker sites to choose from and this means that every poker player should be able to find a site that suits their mood and personality. One of the things that Full Tilt Poker has going for it is the fact that it has a darker edge than most other online poker sites. This is not to say that you’ll find the players on the site anything less than friendly but there is a definitely spark and edge available to this site. The site has not had its troubles to seek over the years, with Full Tilt Poker being notably impacted by the events of Black Friday. However, with PokerStars now in full control of Full Tilt Poker, the future looks bright and players who used to play on the site have returned in great numbers. There may be many poker options to choose from but Full Tilt Poker is the natural choice for so many online poker players. There are many different elements that poker players will look for from an online poker player but if you use a Mac, you will have a great focus on finding a poker site that is Mac friendly. It has not always been easy for online poker players to find a site that is suitable for Mac users but it has to be said that in recent times, there has been a better variety of Mac friendly options to choose from. The Full Tilt Poker site is a Mac friendly poker site which means that it is likely to be a natural choice for poker players of all machines. Even though a great number of poker sites offer a wide range of bonuses, most players usually prefer a simple and straightforward welcome offer. This is exactly what the Full Tilt Poker site provides for players and there is no need to enter a bonus code to get the best possible welcome. New players on the site are entitled to a 100% matched deposit bonus, up to a level of $600 when they make their initial deposit on Full Tilt Poker. One of the more positive elements of the Full Tilt Poker welcome bonus is that it takes into account the first three deposits that a player makes, as long as they are made within the first 60 days of a player signing up for an account. With a 100% matched deposit bonus up to $600, this provides players with the chance to boost their bankroll over the first three deposits. The bonus will be paid out in increments of 10% of the initial deposit or $20, whatever is the smaller figure. Every 25 Full Tilt points a player earns, they will earn $1 of their bonus so to claim $10 of the bonus, a player needs to earn 250 Full Tilt points. Players will have 180 days to fully redeem their bonus. New players to the site will also receive 10 entries to the $50K First Deposit freeroll series and there is also a ticket to a tournament, allowing players access to one of the many tournaments on offer at Full Tilt Poker. There is not an abundance of deposit methods available to choose from with Full Tilt Poker but there should be more than enough options for all players to be able to gain access to what the site has to offer. There are the traditional debit and credit card options for players to select from but there are also more modern methods available too. 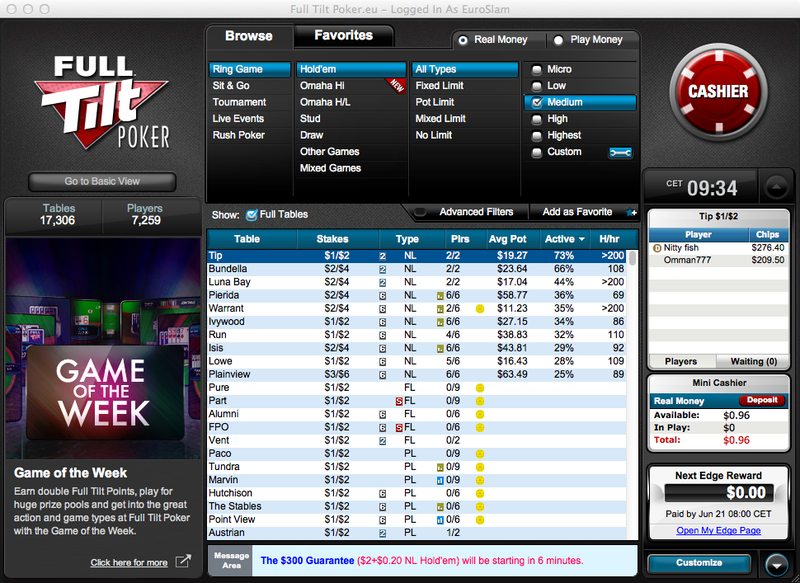 All players on the Full Tilt Poker site can choose to deposit funds via Neteller, Skrill and Entropay options. It would also be nice to have more deposit methods to choose from but the range of deposit methods available should be satisfactory. There is no shortage of promotions available on the Full Tilt Poker site, including regular daily, monthly and weekly promotions alongside promotions that are available for a short period of time. When it comes to poker sites, there is always a large level of focus that falls upon the big weekly game. This traditionally falls on a Sunday and there is nothing out of the ordinary with respect to what Full Tilt Poker serves up for players. The big $250,000 guaranteed game takes place every week and a great deal of the poker games available during the week build up to this game. In total, there is more than $1,000,000 on offer every Sunday at Full Tilt Poker so if you like to take things easy at the end of the working week; this is the poker site that has everything you need. Some of the irregular poker tournaments provided by the site focus on the individual games available at Full Tilt Poker with a perfect example being the Rush Poker tournaments which appear every so often. This style of game is extremely popular at the moment, helping players to get through more games in a short period of time. There are also happy hour tournaments which can boost the amount of Full Tilt Poker points you pick up, which can be a great thing to speed up the process of grabbing your bonus. 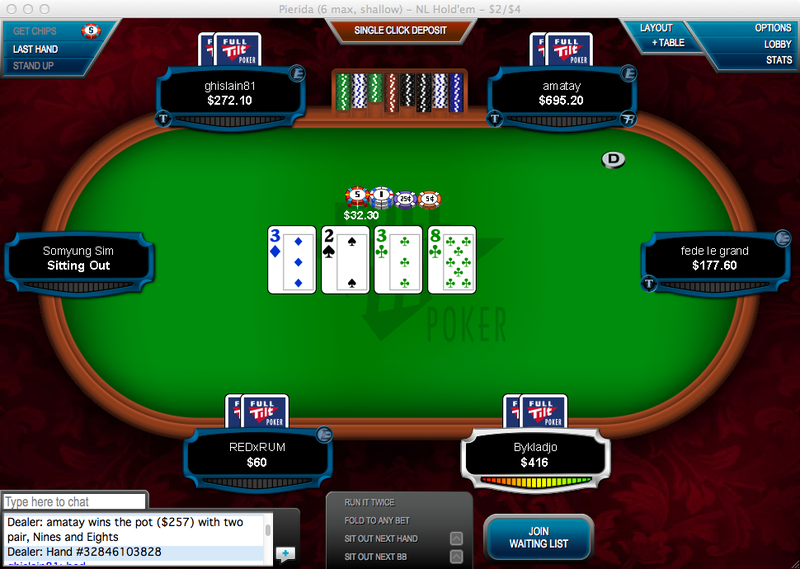 Given that the Full Tilt Poker site is one of the most popular online poker sites, it is no surprise to learn that there are a great number of tournaments to choose from. With a lot of multi-table games to select from and a wide range of sit n go tournaments on offer, Full Tilt Poker delivers everything that a poker player can want. You will find that Texas Hold ‘Em games are the most popular on site but with Omaha variations and other poker disciplines to choose from, there are a number of options to select from. One of the poker tournaments that catches the eye on Full Tilt Poker has to be the Micro Turbo Online Poker Series, which provides a combined prize-pool of $2,000,000 which sees players fighting it out over 15 days for. Sometimes having a focused tournament like this is the ideal way for poker players to get involved with what a site has to offer. While there is no direct rakeback available from Full Tilt Poker, players that earn Full Tilt Poker points will find that they can use the points that they earn to be able to gain access to tournaments, freerolls, to shop and for other activities. It is not quite as straightforward as a traditional rakeback scheme but poker players can still benefit by playing on site regularly.